The M3CH4 TANK custom Qees from Kris Dulfer's solo show at White Star are now up for sale on Tenacious Toys in our Kris Dulfer section. Each 6" tall piece is unique, featuring a 5" Mini Qee, a 2.5" Qee driver and various parts and accessories molded and poured by Kris. You can follow Kris on his Tumblr where he posts up much of his work. 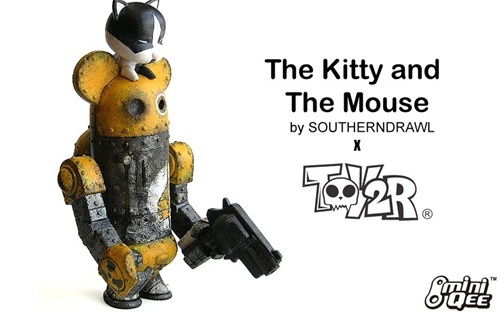 This is your last opportunity to buy Southerndrawl's beautiful Toy2R Mini Qee x ThreeA mashup custom titled "The Kitty and the Mouse." If it doesn't sell this week, we are shipping it back to him and who knows what'll happen to it after that! Probably going to the scrap heap to be reworked into something new (seriously). SD put a lot of work into this one: at 9 inches tall, it was by far the largest Mini Qee custom at the NYC Loves Qee event at Yoyamart in February. For sale here. Our friend Willow from Milan, Italy, sends us this haunting, beautiful and fun time-lapse video of an outdoor mural he executed along with his friend Pao... the scene grows, changes and is painted over several times as the video progresses. VERY cool to see! Willow was the very first artist we had customize a Mini Bomb for our first online custom show. 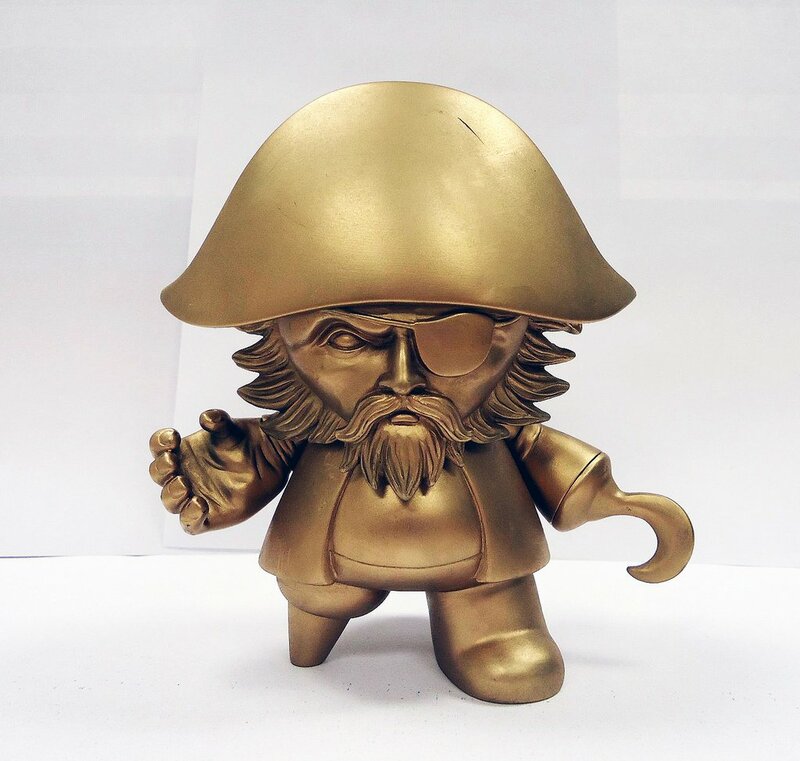 Toy2R is pleased to offer this first look at Jon-Paul Kaiser's original 5" figure - Captain Sturnbrau from the mysterious ship, The Whispering Corsair. Jon-Paul has created a unique collection of Toy2R figures using the mythos of the Whispering Corsair to amass his crew. 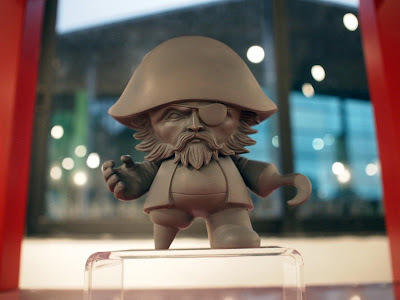 First fans were introduced to the Olaf the Mute (in 8" Qee Bear form), then teasers of the the First Mate Nathaniel Vigo surfaced (in 5" Mini Qee form), now to be followed by their leader, Captain Sturnbrau! Expected for release at this year's New York Comic Con, Toy2R unveiled the figure at the Grand Opening ceremony of the new Toy2R Shunde office in China. 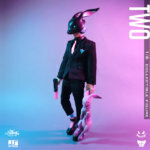 This is the first original production character for Jon-Paul and Toy2R is honored to have collaborated on this project. While there are even more projects being developed for JPK (The Forgotten and The Scribe Mini Qees), the Whispering Corsair collection is a wonderful tribute to the high seas and the mysterious that lie beneath the surface. Expect more surprises surrounding the Captain as the more information develops! Pirate Captain, aka Captain Stūrnbrau. Scourge of the Captain of the dreaded floating hulk; The Whispering Corsair. For time immemorable, land-lubbers and sailors alike dare not speak the ship's true name which slipped past memory and into legend. For centuries the Captain had plied the oceans voyaging into new and undiscovered lands. They disappear for years at a time, only for stories to reach civilization of raids on settlements and pitiless attacks on ships.